This week, Disney’s Cinderella is getting a major reboot. Or a major re-slippering, as the tale would go. On Tuesday, the DVD/Blu-Ray of the newly remastered cartoon will be released. But if you can’t wait that long to relive your princess fantasy, you’re in luck. Starting today on DSW.com and in stores tomorrow, you can shop Cinderella-approved affordable glass slippers. So affordable that you won’t even have to bum a pair off your fairy godmother. Okay, so they’re not really made out of glass. (Because, come on: ouch.) But they’re filled with whimsy and charm and they’re sure to be your first pick for wedding and party footwear. 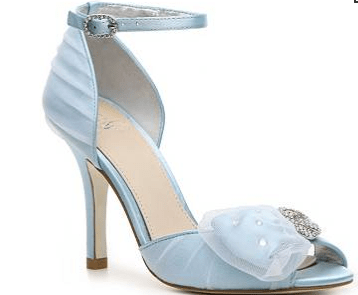 The Cinderella Pump from DSW’s Glass Slipper Collection (above) is the most classic and princess-like of the whole collection. At $89.95, it’s also completely affordable if you’re looking for a standout wedding shoe. I don’t think this particular shoe is that practically for anything else beyond a wedding, but it’s appropriately whimsical for the occasion. The bottom is embossed with a logo of Cinderella’s pumpkin carriage, a wonderful detail that will remind you of the fairy tale on your big day. If you’re just looking for great formal shoes, and not necessarily ritzy beaded pumps, the other “glass slippers” might do the trick. The Charming Sandal is absolutely darling and comes in a variety of rich colors (cute, re-wearable bridesmaid shoes, anyone?) At $59.95, you can’t beat these elegant peep-toe heels that get their signature “charm” from a gauzy bow and bedazzled ankle strap. For a more modern spin on the fairy tale shoe, check out the Princess Sandal. The swirly architecture and fun jewels make the shoes appropriate matches for more dresses. They come in the classic white, off-white, and silver of the other dainty Cinderella slippers, but they also come in a funky hot pink and bold royal blue. And they’re only $79.95. That means you don’t even have to know someone getting married to get in on this whimsical trend: they’re great for any kind of party you’re going to. To see all the other Glass Slipper Collection options, head over to DSW this week. This collection is limited edition, and something tells me you’ll be racing to get a pair home before midnight!